My first exam is in less than 48 hours (SOS). 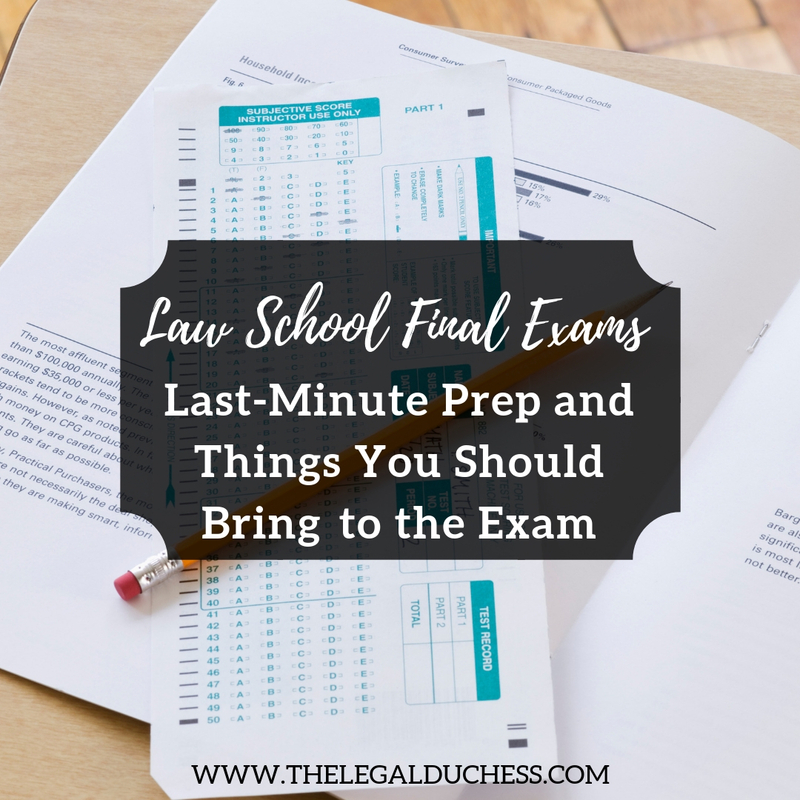 I am sure many of you have exams coming up very quickly as well (if you have not already had one or two). Now that I am in my third year, I have exam week to a pretty good science. Here are my best tips for last minute exam prep and things you should bring to the exam. Most law schools offer online exam software so that you can type your essays. At my school, we use Exam4 and we have to download a new version every semester. I make sure to do this at least a day before my first exam just in case a disaster happens in the process. Many law schools utilize anonymous grading. This means you are assigned a random exam identifying number which you will use to identify your exam. Then when the professors are grading, they are not able to tell whose exam is whose. For my school, we have an online portal where we get our exam number for each semester. I always write my exam number on a sticky note on my computer to avoid every writing it down on an exam incorrectly. For the scantron multiple choice questions. I always take several just in case! I don't trust mechanical pencil erasers. The sound of 30-100 people typing frantically can be very distracting and a cheap set of foam earplugs drown all that out. You can find them at any local drug store or supermarket or on Amazon. Just in case you get the sniffles or the exam makes you want to cry. For the long essay's, a highlighter helps me spot the big issues. Again, this helps me with issue spotting and organizing my essay answers. The contents of my little exam day bag! I like to wear a balance of comfy and cute to my exams. I don't want to look completely homeless but I also want to be super comfortable. My usual exam wardrobe is leggings, a long sleeve t-shirt, and a cardigan. I never want to be cold during exams so layers are a good idea. For morning exams, I always like to have a quick and easy breakfast ready to go. I don't want to take an exam on an empty stomach but I also enjoy sleep too much to wake up super early for a gourmet breakfast. My go-to's are usually cereal, oatmeal, a bagel or I stop and grab a Tom Hortons muffin on my way to school. I am TERRIFIED of sleeping through an exam so I set way too many alarms to ensure I wake up on time. You simply cannot be too careful when your entire grade relies on one exam.